As Ching said, it looks as though i am the official birthday cake baker. Yes, Ching, self appointed. This is our dear friend, Kevin's birthday cake. He requested for cheesecake and since he loves wine, i decided to add liqueur and coffee to the Cotton Soft Japanese Cheesecake recipe and making it marbled. 1. Preheat oven at 300 F and bring a kettle of water to a boil. 2. Lightly grease and line the bottom and sides which should be 1 1/2 " above the rim of a 8" pan with greaseproof paper. 3. Melt cream cheese, butter and milk in a double boiler. 4. Cool the mixture. over iced bath. 5. Fold in the flours, egg yolks, sugar and Kahlua and mix well. 6. Whisk egg white until foamy, then add in cream of tartar and whisk on the highest speed. 8. Add 1/3 of the whisked egg white into the cream cheese mixture in 5. Mix it really well with the biggest spatula available. 9. 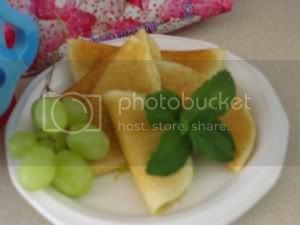 Fold in the rest of the egg white and then FOLD in, from the center to the sides and not forgeting the bottom of bowl. Do not overmix. and adding 1/2 tsp of coffee emulco for the colored portion). Line a roasting pan with a kitchen cloth at the bottom and place cake pan on the cloth. Place roasting pan in the preheated oven and pour boiling water into the roasting pan. Water level should be half way of cake pan. 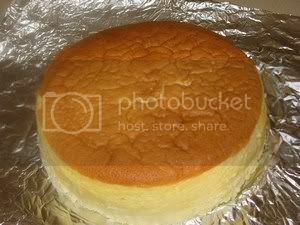 11 Bake cheese cake for 1 hrs 30 mins or until set or golden brown. 12. Leave in the oven with door ajar for an hour until cake cools. 13. 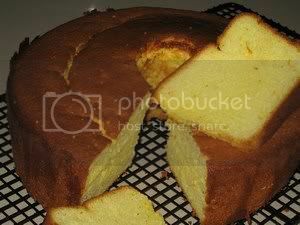 Take it out of oven and turn cake out of cake pan. Wrap with aluminium foil and leave in the fridge. 1. Whisked the Dream Whip with the chilled milk in the highest speed until stiff. Add in the Kahlua. 2. Iced the cheesecake with the whipped cream and decorate cake. 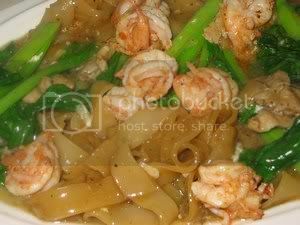 Back in Malaysia, fresh Hor fun or rather koay teow(hokkien) is so readily available. There used to be only one type and the size determines whether it is meant for frying or for soup. But, nowadays, the ones for soup, although the size is still smaller is made specially for soup. The best ones are found in Ipoh. Here in Denver, you will be lucky if you can find them not so frozen and who knows how long they have been on the shelves. There is a brand which is 'Southern California' which i managed to get from the Korean store that i frequent, but they did not replenish when stock went out. They have at the moment hor fun made in Denver, which is more rough. There is no choice but to go for the dried ones. 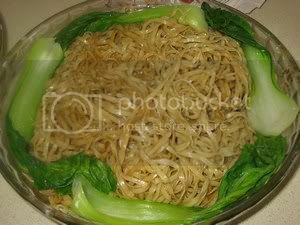 Surprisingly, if it is steeped properly and being able to recognize the texture when frying, a delicious plate of noodles can be dished out. Heat wok until very hot, add in enough oil to grease the wok, over hot fire, fry a handful of the the hor fun . Add light and dark soya sauces and stir fry briskly. 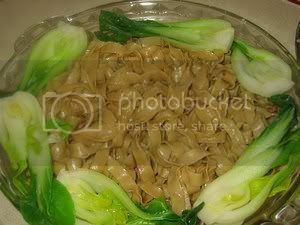 Allow noodles to burn a little at the edges to obtain a smaky taste. Put aside on a platter. Repeat with the rest of the hor fun. Heat 1 tbsp oil and fry prawns and calamari until cooked. Dished out. Add 1 tbsp oil and fry the pork until it is cooked. Add in garlic and fry until fragrant. Pour in the stock and bring to the boil. Let simmer for 5 minutes. Add in the choy sum and when gravy comes to a boil, add in the cornflour mixture. Bring gravy back to a hard boil to cook the cornflour. Add in the cooked prawns and calamari. Season to taste. Turn off heat and crack in the 2 eggs, stir to cook the eggs. Dish gravy onto the fried hor fun. 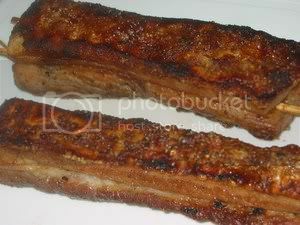 I have to buy belly pork with skin from the Vietnamese Store and most of the time is very lean and don't look very fresh. The Korean Store's belly pork is the best but it is in strips and a block is not available. Bought a pack and decided to try out 2 strips. The strips are about 1 inch - 2 inch wide and i figured that when roasted it might curl like a shrimp. So, l skewered the pork strip and keep my fingers cross. It turned out pretty good and i prefer the strip because it cooks faster. 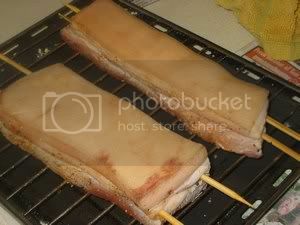 Skewer the belly pork strip. Bring 2 cups of water + 2 tbsp vinegar to a boil in a wok. Scald the rind only. In a dry wok, fry salt, garlic powder, 5 spice powder and pepper for a few minutes to marry the flavor. Mix in the sugar and rub this mixture onto the meat. Leave uncovered, rind side up in the refrigerator overnight to dry out the rind. Turn on oven to 450 f, rub the rind with oil, and bake for 20 minutes rind side up. By now the meat should be cooked and the rind is soft enough. Use a carving fork and poke into the soft rind as much as possible. Turn on the grill and broil the rind at least 4 inches away from the elements. It will take at least 20 - 30 minutes before the rind will be crackling ready. Check now and then and turn meat around for even broiling. Lastly sprinkle some salt on the crackling and continue to broil another 5 minutes. Let the roast rest for 10 minutes before serving. Fried wonton using the 'all eggs sang mein' dough does not remain crispy but they are fabulous in soup. 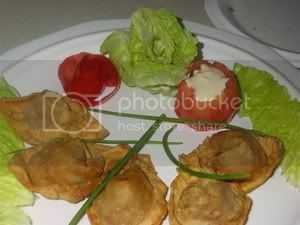 If you are planning them to be an appetizer, eaten with chilly sauce, then i would suggest using these Wonton Wrappers. Mix all the ingredients for the filling together with the seasonings until well combined and leave in the fridge for 1/2 - 1 hr. Place one teaspoon of the filling in the centre of each wonton wrapper. Fold into a triangle. Wet one end of the longest side of triangle and let the other end meet. Pinch to seal. Repeat until all wrappers are done. Heat enough oil in a wok until just hot. Put in wonton in batches and deep-fry until golden brown in colour. Serve the crispy wonton with the dipping sauce or mayonnaise. Ccombine all the ingredients for the sauce and mix well. This sauce is also ideal for any other deep-fried foods. Serve the crispy wonton in soup of your choice. Patience again has the major role here, steam on medium low heat to achieve success. For richness in flavor, reduce the sugar and substitue with 1 tbsp of condensed milk.This custard is good according to the chinese - it will soothe a sore throat , 'yoon' the lungs and the ginger digests. Have this as an after meal dessert and have it piping hot. 1. Dissolve rock sugar in the water, cool a little. 2. Beat egg lightly,stir in syrup and ginger juice. 3. Transfer egg mixture to containers. 4. Steam over medium low heat for 6 minutes until set. (Time may vary to different containers). I promised my dear friend Lena that i will try this recipe by Alton Brown from Food Network and give her a review. This recipe is a keeper for me. 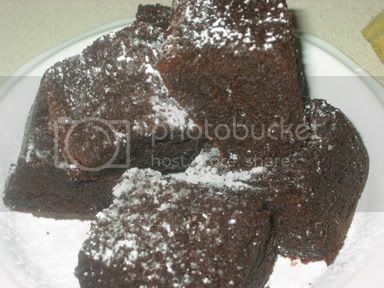 It is like a moist chocolate cake, not too sweet and the best part is, it is so easy to make. Kosher salt is less salty, so use less if fine table salt is used. Like the recipe suggested. do not attempt to cut before it is cooled. Renee could not wait to eat and i have to use a big pizza cutter to cut when it is still slightly warm. Add both sugars. Add remaining ingredients, and mix to combine. When it's done, remove to a rack to cool. Resist the temptation to cut into it until it's mostly cool. 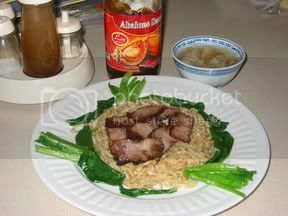 What better ways to eat sang mein than kon loh. 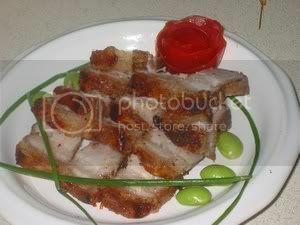 Just garlic oil and soya sauce will do but for those who are not health concious, lard is the essence in kon loh. It will be better if you can get hold of some roast pork fat and i can assure you of good eats. Lena, please save your pork fat the next time you make your roast pork. Suggestion of favarite accompaniments with mein would be Braised mushrooms and fried chicken feet, Char Siew, Wantan, Braised Beef(ngau lam), White Chicken, Roast Duck etc. Heat a 8 quart pot with 3/4 full of water and bring to high boil. Drop in mein and swirl it around. If cooking the very thin ones, it will only take a short while, the flat mein takes slightly longer. Remove with spider strainer and 'kor lang hor' - put hot mein into a big pot of very cold water(to stop the cooking). When the water comes hack to a boil, put back the mein to heat it up. Remove and drain, then mix with the seasoning. Put in the vegetable to cook in the water that was used to cook the mein. Vegetables will remain green as the mein is made with potassium carbonate & sodium bi-carbonate solution. Do not cook too long, otherwise the vegetables will be too soft, then it will not be good eats. Mein can be made eggless and this recipe is totally the opposite. I do not use water, the liquid is all eggs. So, this noodle can be considered enriched. 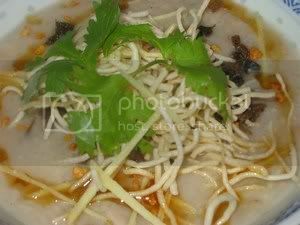 To obtain al dente, cooking the mein in the largest pot is important, as large quantity of water is needed and the mein is to 'koh lang hor' - pass through cold water. The mein can be kept in the freezer. It can be deep fried and the mein is then called 'yee mein'. Sift 2 1/2 cups flour into food processor(use the plastic blade) and add potassium carbonate & sodium bi-carbonate solution and eggs. Pulse a few times, as soon as dough is in pea size crumble, the dough is ready(Add more flour if it is too wet). Remove from food processor and press crumble into a dough , then leave to rest in a sealed ziploc bag for at least 30 mins. Knead dough and roll out into rectangular shape, then cut into four equal pieces. Dust each piece with tapioca flour lightly to prevent sticking. Cover the pieces with a clean dry tea towel. Prepare your noodle machine by adjusting the knob with the rollers to the widest setting. Insert dough and turn the rollers slowly. Keep rolling the dough through the noodle machine until you get to the thinnest. Next, set the machine for shredding then shredd the dough. Repeat this procedure with the rest of the dough. Toss the noodles lightly in tapioca flour to prevent them from sticking together. The mein is ready for cooking or pack into ziplog freezer bag and keep in freezer. A bowl of hot congee on a cold winter day is so comforting. Congee must be eaten very hot and slurpping cannot be avoided. Strangely, congee is eaten on very hot days too. 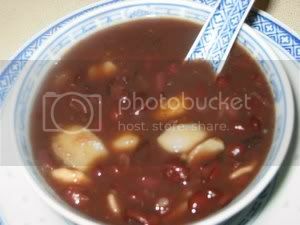 Every chinese dialect has their own version and this recipe is very cantonese. 30 g glutinous rice washed. Put peanuts in a pressure cooker and boil in just enough water for 30 minutes. Bring water to a boil, add in rice, pork, mussels ,peanuts and the seasonings. Continue to cook and stir frequently with a large whisk. Add more water if required and cook until rice is soft, puffy and liquidfied. Remove the pork and shred. Return shred to Congee and season to taste. Dish out and serve hot congee with garnishes. Thank you Rabiit sim for posting this recipe. Indeed this recipe is fluffier becauce the amount of egg yolks are considerably much more than the Cotton Soft Japanese Cheesecake. The absence of superfine/cake flour which is low in gluten does make a difference. I have reduced the cream cheese to 8 ozs (225 gm), making it more friendly user and added 1 tbsp of lemon juice for flavor. Both recipes are a keeper. Thanks again. butter and plain flour (for buttering the mould). 1. Melt A. over a pan of simmering water until the mixture liquefies (stir every 3 minutes), use spatula to stir the mixture well. 2. Mix B. until cornflour dissolves and pours into 1, stir until well-combined. Add in beaten yolks and strain the mixture. 3. Preheat oven to 150°C/300°F. Line bottom of mould with baking parchment paper. Butter the sides of the mould and coat it with plain flour, remove excess flour. If using loose bottom cake tin, cover the outside of the tin with 2 layers of aluminium foil. 4. In a clean bowl (make sure oil less and waterless), beat the egg whites till foamy and add in sugar and cornflour in 3 batches and beat until soft peak. 5. Take 1/3 egg white and stir into the cream cheese mixture to loosen the batter. Pour the remaining egg whites and using cut and fold method quickly fold in the egg whites, do not over fold or else the air in the egg whites will escape. 6. Pour batter into cake tin. Sit the tin in a bigger mould or baking tray. Bake in a bain-marie (water-bath). Water must be boiling hot when poured into the baking tray or bigger mould. Water level should come up to ¾ of the height of the cake tin, at least half if you cannot manage ¾. 7. Put in oven and bake for about 25 minutes or when top is brown, reduce the heat to 125°C/260°F, continue to bake for another 1 hour or until a cake skewer comes out clean. Let the cake cool in the cake tin and remove from tin when cooled and refrigerate (it’s ok to leave the cake in the tin and refrigerate). 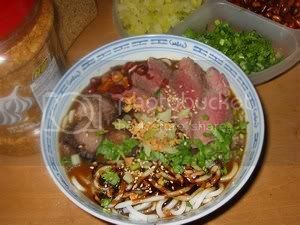 This style of beef noodle can only be found in seremban, malaysia. The Mccoy is long gone and the present seller has managed to create one similar and is laughing all the way to the bank. I have my own creation and it is for home cooking. I do not have the whole cow in my recipe as the family does not fancy them and this is a set back to making the gravy as it requires the best broth that the whole cow can produce. Cook 'lai fun' according to package instruction. Cut the sirlion steak into strips of 1 1/2 inches. Marinate with seasonings, the longer the better. Heat oil and fry the beef strips in batches, do not crowd. Fry until cooked and sort of crispy on the outside. Leave to cool before slicing into thin slices. Pan fry the steak on a heated pan with 1 tsp of oil, 4 mins on one side, flip and fry another 3 mins on the other side(this will be medium rare). Let it rest for 15 mins(tent with aluminium foil) before slicing. Heat oil and make a roux with flour. Add in the instant paste, dark soya sauce and salt and pepper to taste. Keep gravy on the lowest heat to keep warm. Put warm 'lai fun' in a soup bowl. Pour in enough of gravy(about 1 cup). Top with sliced meat and the rest of the garnishings. Sorry folks, MeMe is not a dish, so, no recipe. The baton was passed on to me by Foodcrazee to continue. Where should i start because childhood was so............ long ago as anyone who has read my profile knows that I turned sixty this year. All you young bloggers who read my MeMe would have to refer to your parents. uncles, aunties and some grandparents for the matter, to get them to verify mine to their childhood memories and enjoy some bonding time. The fondest memory is at dawn,standing in front of the stove with the enamel cup waiting for the kopi tiam's boss to fill with Kopi 'O' and a big slab of margarine together with kaya will be on the tiny plate that i have brought. Home I go, as by now hungry 6(brothers and sisters) will be waiting with the sliced white hainanese bread. In a moment, we will have 7 funny expressions on our faces - the bread was sour. We would opt for 10 cents from MOM and head to school, where we would stop by the Loh See Fun stall and enjoy a bowl. 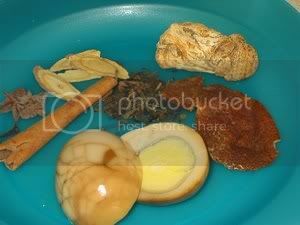 I still prepare this Loh See Fun Seremban Stylefor my children and friends. My siblings although we are all over the world but when we are back in malaysia, seremban is our pilgrimage. Or we could go to the Chee Cheong Fun man's house which is way to the back, down the road of our home and get some of his most delicious Chee Cheong Fun and Woo Tau Koh. 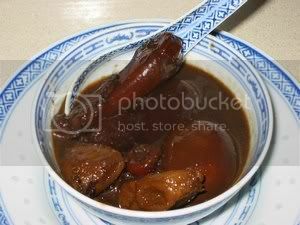 He served them with Teem Cheong(red type) and chilly sauce and the best of all, the Tau Kok Sueen(pickled long beans). Around lunch time, Hoong Mien, our Yeong Tau Foo man would be coming. He was called so because his face was always flushed. His ware was really special as I have never seen them being sold any where. He had the regular tofu white or fried, fish balls and the specials were - long beans twirled together and a slab of fish meat on top. He did that too for Kangkong(oong choy) and Sawi(choy sum). Wait and we can hear the Kacang Putih man calling. He will have his table on his turbaned head and we will shout - "Put down quick quick." His table had sections of fried peanuts, muruku, chickpea and vadai. The best part was he did not mind when we took a handful for tasting as the one we paid for came in the longest and slimmest cone which housed only about 10 peanuts. He insisted that my name is LULU and once during my adult life, did manage to meet him and he recognised me - he called me LULU. There are many more and when we have the opportunity to gather, my brothers and sisters and I will talk and laugh at all the things that happened and what we ate during our childhood. If any of my siblings are reading this, remember the early morning Yum Cha in Toong Chan with Dad where we have to peel the skin of the paus? What about the Chew Chow Chook with the best Hum Choy. Hey, what about the Cheap Matinee in Cathay and the must have - black kua chee and the kanna. I think i have better pass the baton on before everyone falls asleep reading this grandmother's stories. Fond memories of childhood days when a vendor would come to our home doorsteps with a full basket of bowls. 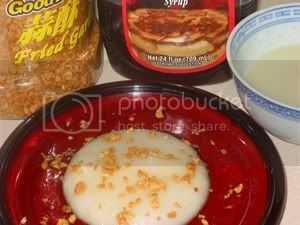 She would use a bamboo stick(lidi), scrape the side and bottom to loosen the koh, then divides it, overturns it onto our plate and then tops with sweet or savory toppings of our choice. It marveled me to see how efficient she was with the stick as she had a group of eager children wanting to be served first. Mix ingredients (A) and blend into a batter. Strain into a large glass bowl. Microwave on high, 1/2 min at a time until mixture thickens but still runny. Place lightly greased bowls in a steamer to heat them up. Fill with the batter and steam over rapidly boiling water for 15 to 20 minutes(depends on how much batter) or until cooked. Cool the rice cakes well, then remove from cups and scatter topping ingredients over. Garnish and serve with chilli sauce. Heat oil and saute garlic until fragrant. Add radish and stir-fry, add water and cook over low heat for 1/2 hour. Stir occasionally to prevent burning. Add seasoning and blend well. Dish out and use as a topping. In the third picture which has the savory topping, this is not the radish topping that is in the recipe. I had leftover Mui choy with Pork and since i made half recipe, i was lazy to make the radish topping. In fact, i prefer to eat mine sweet. I have given up hope of eating a good onde onde. 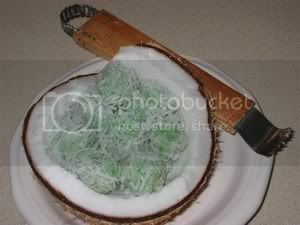 it is the grated coconut which has to be grated fresh that gives the onde onde its character. I have tried all sorts of grated coconut and have not found one that is suitable. My search for one has ended. I have found the utensil which grates a fresh coconut to perfection. Boil together the tapioca flour, oil and 200 ml water over low heat. Keep stirring till only 3/4 cooked. Allow mixture to turn transparent. 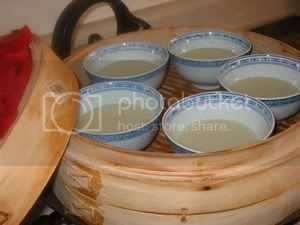 Pour the tapioca mixture immediately into the glutinous rice flour in a large bowl. 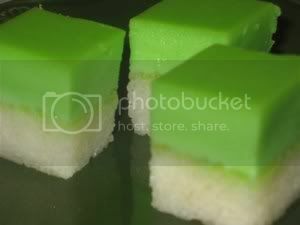 Stir till well absorbed and gradually add in the pandan paste, salt and green food coloring. Stir well and knead to form a firm smooth dough. If dough is too soft , add a little glutinous flour. Divide dough into small pieces and form 1 inch size balls. Flatten each piece, put half a teaspoon of filling in the centre and roll into onde-onde balls. Drop the onde-onde into boiling water. Reduce heat to medium. When the balls are cooked they will float. Continue to cook for another 2 mins to dissolve the sugar and make it syrupy. Scoop up the onde-onde with a perforated ladle, dab ladle over dry cloth and then toss onde onde in grated coconut. Homemade is always so much better as the ones bought for breakfast or tea are often inferior in taste. Years ago there was a lady who sells the kind that i like best in Taman Selera, Old Town, Petaling Jaya. I have sort of replicated the recipe to the best i think it should be. 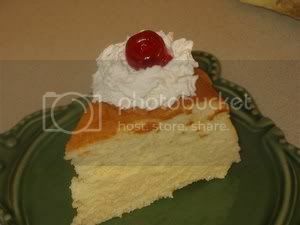 This cake aka koh has many variations and the toppings too have no limitiations. 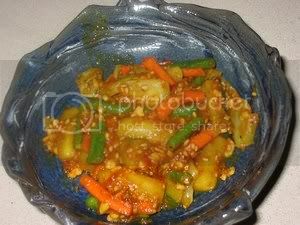 I have eaten a version without toppings but it is served with a minced meat sauce. There is one which cooked black eye peas is added and that is quite pleasant as the peas behave the same as a mashed taro. Some of the toppings are lap yoke, dried prawns, peanuts, choy poh, fried shallots, fresh red chillies and chopped spring onions and i like only dried prawns, fried shallots and spring onions. Would love to have fresh red chillies, only i can get them. Heat 4 tbsp oil and saute dried prawns till fragrant. Remove 3/4 and set aside for garnishing. Add 2 tbsp oil to the remaining oil in the wok, add diced yam and stir fry well. Mix in water and bring to a boil. Add in (B) and seasoning and cook till batter is fairly thick. Pour thick batter into a well-greased 20 to 22cm round tray. Steam till kuih is set and cooked through. Spread the garnishing on top and press lightly. Leave aside to cool. 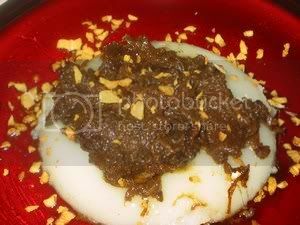 Serve yam cake with chilli sauce. The ingredients are simple, just egg, water and seasoning but the crucial part is in the steaming. A slow simmer is needed as the result should be soft and smooth. Turn on the heat higher with impatience and you will get disaster - overcooked. You could substitute water with soya bean milk and stock/broth si delicious too. Bring water to boil in a steamer and turn down heat to low simmer. Beat eggs, water, sherry and salt with a fork or a pair of chopsticks(a whisk creates too much foam). Sieve into a 6 inch deep dish and put to steam. The time it takes to cook depends on heat of the water. Have patience and the eggs will be done when it is no more runny when a knife is inserted in the center or from experience, shake the dish and it will jiggle but will be firm. Remove and sprinkle will sesame oil, soya sauce and spring onions. Serve while it is hot. This dish is quite laborious but the time taken is well spent as it goes well as an accompaniment to any spicy meal or eaten by itself. Use it as a dip with prawn crackers which is one of the favorites of The Chinese New Year. The vegetables i used are must have but other vegetables like cauliflower, french beans, fresh red and green chillies, whole shallots are good additions. Quarter the cucumber lengthwise without peeling them. Remove its core and cut into1 inch long strips. Cut long beans into 1 inch length. Remove the center stem of cabbage and cut them into 1 inch pieces. Tear the leaves into 2 inch squares. Julienne carrots into fine strips of 1 inch in length. Bring water, vinegar, sugar and salt to a boil. The cucumber and cabbage have to be squeezed to rid of as much excess liquid as possible. Heat the 4 tablespoons oil in a wok and saute the ground spices until aromatic. Add seasoning and bring to a quick boil, turn off the heat and allow to cool completely. Add in all the prepared vegetables. Stir to mix and bottle the acar. Allow the acar to pickle for a day. These beef balls are crunchy and bouncy but somehow i prefer the pork balls which are tastier. It could be the cuts of beef that determines the flavor. Any how, i do not have to buy those frozen beef balls which are pretty expensive. 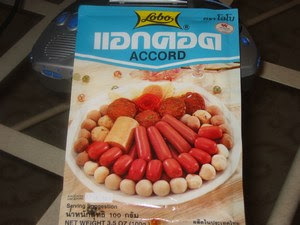 For information, here is a picture of Accord and according to the literature at the back of the pack 'Accord is a blend of special phosphates which bind and emulsify comminuted meat. 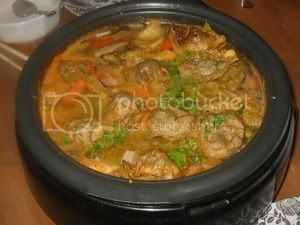 Hence it can retain moisture, flavor and juiciness of the meat protein. When cooked, Accord makes the meat emulsion softer with better adhesion and less tendency to render out Accord is suitable for making sausages, meat balls and meat loaves.' Ingredients: Pyrophosphate and Potassium Phosphate. 1. Wash and pat dry meat, cut to smaller pieces. 2. Mince in a food processor till it becomes a paste. Add a tablespoon of water at a time, to ensure smooth blend (not to much) If food processor is not heavy duty, try divide it in 2 portion. 3. Mix other ingredients together to liquid (except pepper). 4. Transfer meat paste to cake mixer and using paddle, beat at high speed. 5. Pour liquid mixture to mince meat and beat till well blended. 6. Cover meat with clink wrapand leave in the frezzer for 30 minutes. 7. Boil lots of water in deep pot or wok. Take out meat from freezer, add pepper, stir well. 8. When the water comes to a boil, turn off the heat. 10. Turn on the fire and simmer slowly. 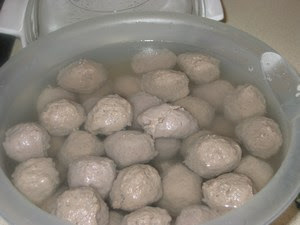 When the balls start to float, let them cook further for few more second (cooked balls should not be pink inside). Remove and let them cool in cold water. 10. Bring the water back to the boil and repeat with the remaining meat. 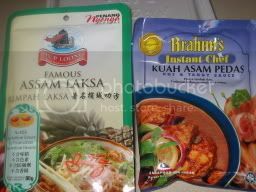 The ingredients for the ground spices are not readily available here, so i make my asam laksa using Hup Loong Asam Laksa and for the fish, canned sardines and tuna. 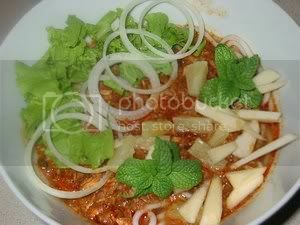 If I am back in Malaysia i will certainly cook asam laksa following the recipe below. Boil fish in just enough water. When cooked, remove the fish and strain the stock. Then flake the fish and set the fish aside. 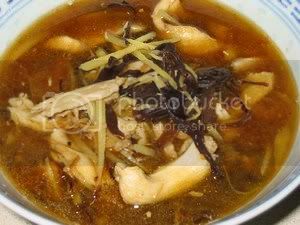 Put tamarind juice, ground ingredients (A), water and fish stock in a pot. Add polygonum leaves, dried tamarind skin and lemon grass. Bring to a low simmering boil for 10 minutes. Add the flaked fish and seasoning to taste. Continue to simmer for an extra 10 minutes. To serve, put a handful of laksa noodles in a metal strainer and immerse in a pot of boiling water to scald the noodles for half a minute. Drain and put into a bowl. Pour a ladleful of laksa soup or gravy over the noodles and garnish with a little of each garnish. Drizzle a little prawn paste over and serve immediately. You can also serve the prawn paste separately. cook according to instructions, add sardines and adjust taste. Must be sour, sweet and salty. I made this birthday cake for Raven's seventh birthday and her favorite cartoon character is Kim Possible. You should see the delight in her face when the cake was presented and i am glad she recognized the character despite of my non-professional skill in icing the cake. 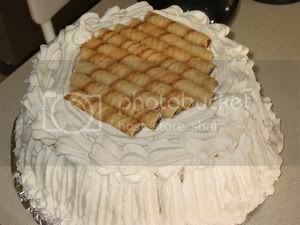 I had to homemake piping gel and this buttercream recipe has not failed everytime i make it. I have to resolve using a boxed cake as all of you know that i have a handful or rather 2 laptops. Follow the instructions of any boxed cake and bake in 13" x 9" cake pan. In your mixer bowl, beat the shortening until it's smooth, add the butter and beat together until smooth and light and fluffy. Add smaller amount of the heavy cream indicated in the recipe and the vanilla and mix well. Add half the powdered sugar and mix for 5 minutes on low-med. speed. Add remaining sugar and mix well. Add more cream or powdered sugar if necessary to adjust the consistency. 1. Sprinkle the gelatin over the cold water in a small saucepan and let set for about 5 minutes. Heat on low until the gelatin has become clear/dissolved - DO NOT BOIL. 2. Add the syrup and heat thoroughly. 3. Cool and store, refrigerated, for up to 2 months. To Color: Add coloring paste/gel or food coloring drops to get desired color. To Use: Put in icing bag, plastic squeeze bottle and decorate. 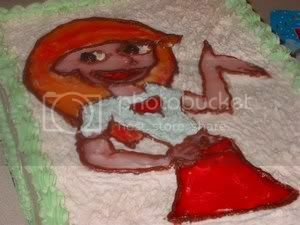 Iced the cake with the buttercream and pipe in the outline design for cartoon character, Kim Possible and then fill in design with colored piping gel. For warm weather: As a general rule, buttercream does not hold-up well in warm, humid weather. Tami's Buttercream(from baking911.com) will hold up better if you use all shortening instead of butter. 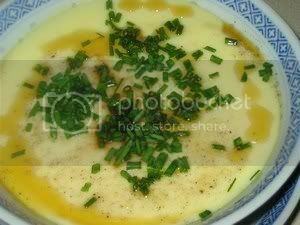 (Substitute the butter in the recipe with shortening and in addition, add in the shortening called for in the recipe). Also, substitute 1/4 cup powdered sugar with meringue powder. I have to thank Edith for posting this recipe. I have changed the fresh milk to fresh heavy whipping cream and the method of preparation. I use whatever brand of cream cheese that is on sale. 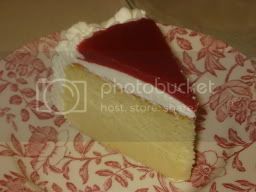 The cheesecake turned out very well and i have dressed with fresh whipped cream and a strawberry topping. I made the cheesecake a day ahead and dressed it the next day when we had guests from Las Vegas visiting. I wonder if the texture is fluffy when eaten fresh as mine cuts beautifully for it was slightly densed. 3. Melt cream cheese, butter and heavy whipping cream in a double boiler. 43. Cool the mixture. over iced bath. 5. Fold in the flours, egg yolks, sugar,lemon juice, salt and zest and mix well. 8. Add 1/3 of the whisked egg white into the cream cheese mixture in 4. Mix it really well with the biggest spatula available. 10. Pour into a 8” round cake pan . Line a roasting pan with a kitchen cloth at the bottom and place cake pan on the cloth. Place roasting pan in the preheated oven and pour boiling water into the roasting pan. Water level should be half way of cake pan. 1. Thaw the strawberries and then pass through the sieve. 2. Bloom the gelatin with water. 1. Whisked the heavy whipping cream in the highest speed until soft peak(do not overwhipped, under whipped would be desirable, finish whipping by hand, whipped cream will turn to butter if overwhipped). Add in sugar. R & K stand for Raymond and Karina who graciously brought the powder from Singapore. This jelly will not be possible if not for them. 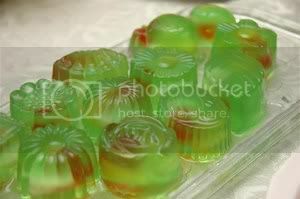 Renee loves this type of jelly which is Konnyaku. Mix the konnyaku powder and sugar together and mix them well. Pour the mixture into the liquid gradually and stir till it comes to the boil and turn off the fire. Keep stirring for 5 minutes till the bubbles disappear. Add citric acid and coloring and stir well. 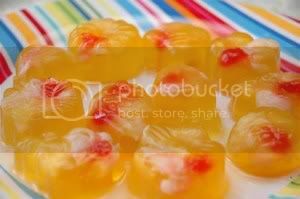 Put pieces of fruits in the moulds and fill the moulds with jelly. Years ago this bun is known as the Mexican bun. 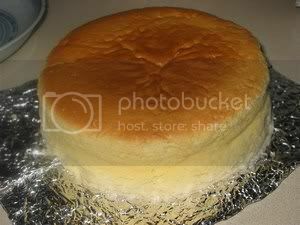 When a friend asked if i know how to make rotiboy, i had to look it up and found that rotiboy is mexican bun.The rotiboy consists of three parts: the filling, topping, and sweet dough. 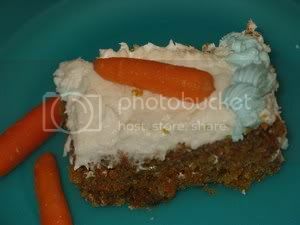 The filling and topping can be prepared beforehand and kept in the refrigerator until ready for use. The ingredients and instructions for preparing each of the three parts are given as follows. Please don't be put off by all the steps, it is very detailed. 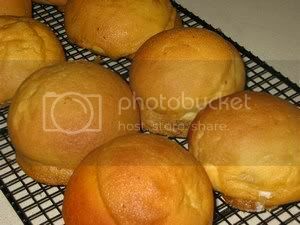 The aroma fills your home while the buns are baking and i would suggest eating them fresh when they come out of the oven. Beat butter in electric mixer on medium speed with the paddle attachment for three minutes. Blend in salt and refrigerate until firm. Divide mixture into 10 g portion into ball. Keep refrigerated until ready to use. Beat butter and icing sugar in electric mixer with the paddle attachment on medium speed for five minute until mixture is light and fluffy. Sift in flour and mix on low speed until combined. Mix 1/2 of the flour, soya bean flour,castor sugar, yeast and salt in electric mixer with paddle on low speed for one minute. Add egg and water and mix on low speed for another minute. Mix on medium speed for eight minutes until dough forms like spider web. Change to dough hook and add the rest of the flour slowly. Mix five minutes more on medium speed until soft, smooth and elastic(but not sticky) dough forms. 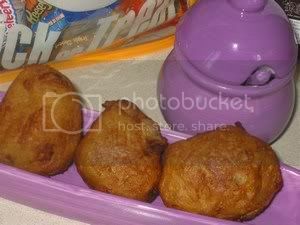 Remove dough from mixture and shape into a ball. Divide the dough into 55 g portions(should get 17 portions). Flatten a ball of dough with the palm of your hand. 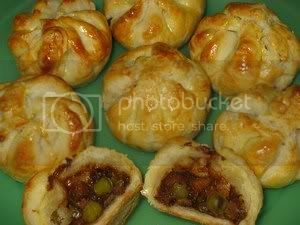 Place a ball of filling in the centre of the dough. Pat into shape and place on a greased baking tray. Repeat with remaining portions of dough. Place each bun about 7.5 cm apart on the baking trays. Prove for 45 min in a warm place. Bake in preheated oven at 400 deg f for 12 mins, turn off oven and let the bun continue to brown. We had a neigborhood block party and had to make something that is a pleaser as our neighbors are mostly caucasian. 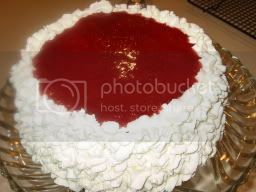 This is a moist and not so densed cake but the frosting is too sweet for me , anyway i guessed it should be sweet otherwise it will not be a frosting. Grease and flour a 9x13 inch pan. 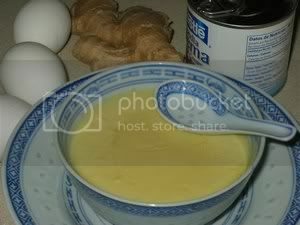 In a large bowl, beat together eggs, oil, white sugar and 2 teaspoons vanilla. Mix in flour, baking soda, baking powder, salt and cinnamon. Bake in the preheated oven for 40 to 50 minutes, or until a toothpick inserted into the center of the cake comes out clean. 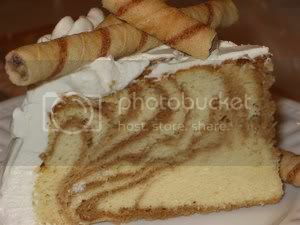 In a medium bowl, combine butter, cream cheese, confectioners' sugar and 1 teaspoon vanilla. Beat until the mixture is smooth and creamy. Eating this dish is best eaten at home where fingers can be licked and a mess made with the shells. The sauce is good for toasted bread but my family loves plain white rice. Saute ingredients (A) in two to three tbsp oil until aromatic. 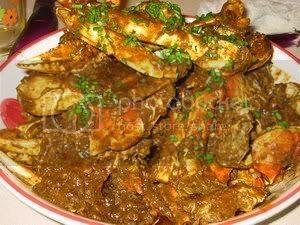 Mix in seasoning and the brain of crabs, bring to a boil(sauce should thicken). Add the crab pieces and stir-fry well. Then allow to simmer till sauce is slightly thick. Black Vinegar purifies the blood, Old Ginger drives out wind, and Brown Sugar puts a check on "dampness". Pig's Trotters are said to provide collagen which is good for strengthening joints & lumbar. Sesame Seed Oil is also to promote blood circulation and the eggs for nourishment. This is a dish cooked for postnatal moms and in my case the mom did not like it and I ended eating most of it. Clean & pluck off the hair from the pig's trotters. Heat Sesame Seed Oil and fry ginger until golden brown & fragrant. Use a BIG corningware casserole, add fried ginger,vinegar, water, and brown sugar. Bring to a boil and leave to simmer for 1/2 an hour until ginger becomes soft. Add shelled hard-boiled eggs 1/2 and hour before serving. This dish tastes better upon standing for days! For Cantonese, this is traditionally cooked for distributing to relatives on the 12th day after delivery to inform them of the new addition to the family. New mothers are encouraged to drink this Chicken Wine to promote blood circulation & invigorate major organs in the body. The wine is good for warming the lower body, "mok yee(wood fungus)" has the property to cleanse the uterus and peanuts are good for promoting milk. Marinate Chicken (use: 1 tsp sugar, 1 tsp soy, 1 tsp oil) for 5mins. Heat sesame seed oil. Fry ginger until fragrant. Add Wood Fungus, peanuts, & chicken. Stir fry well for a minute or two. Pour in 2 cups hot water and bring to a boil and cook until chicken is cooked. Finally add in the Stone's Ginger Wine and bring back to the boil. I had to make ang koo for Alexander's full moon party and i have made them before for Renee's one year old party which was 3 1/2 yrs ago. This time the koo looked good but was not as soft. It was a pleasure to have Ah Mah Chew and family at the party. Ah Mah Chew was visiting from Malaysia and before she left for home, graciously taught me how to make ang koo, hokkien style. As all good cooks of yesteryears are, she does not have weigh and spoons and i have to document this recipe when i tried making them. Thank you Ah Mah Chew, the ang koo is nice and soft. Add coloring to hot water from (b). Add to (A) and mix well. Knead to form a smooth but not sticky dough. Divide dough into equal portions and roll into balls. Flatten each portion slightly, add a small ball of filling. Pinch and seal the edges. 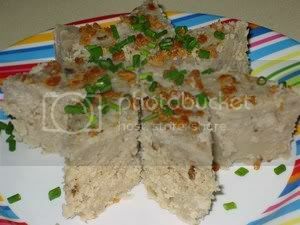 Lightly dust ang koo mould with glutinous rice flour. Press each ball of dough into the mould. Knock mould lightly against table and the ang koo will slide out. 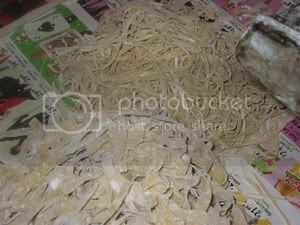 Place each ang koo on greased, cut-out banana leaves. Steam ang koo over boiling water for four minutes, then open the lid and continue steaming for six more minutes or till cooked. This will ensure that the pattern comes out sharp and clear after cooking. Remove ang koo from steamer and brush lightly with oil to prevent them from sticking to one anotherand also to get the sheen. Steam green peas in a steamer for 20-30 minutes or till soft. Pulse the steamed green peas in the food processor. Pour into a big microwable glass bowl, add in all filling ingredients and cook in the microwave on high till mixture is almost dry. 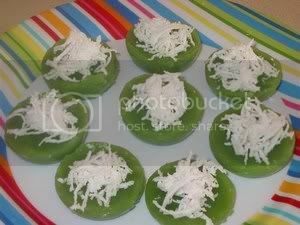 Remove the pandan leaves and leave aside to cool. Roll green pea paste into small balls and set aside to be used as filling. The fragrance of herbs in the air while making this dish brings back fond memory of the fragrance you get when you come near to the chinese medicine shop at a mall in malaysia which sells these eggs. Put eggs and enough water to cover the eggs(have these at room temperature), bring to a boil. Remove eggs and soak in cold water. Put seasoning together with another half pot of water and bring to a boil. Add the cracked eggs and add enough water, simmer over gentle heat for half an hour. Soak eggs for two to three hours or longer before serving. Once cold they can be stored short term in the refrigerator. Remove shells and serve eggs with a dash of pepper and a sprinkling of salt. 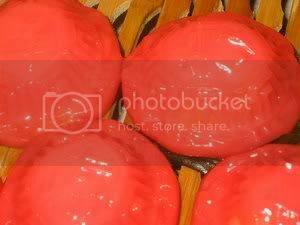 Pao is usually steamed but in this case it is 'siew' which means baked and it is actually a pastry - chinese pastry of which 2 types of doughs are used. I prefer to use lard for the oil dough which enhanced the flavor to the pastry. For health reasons, shortening is a better choice. Process the all the above in a food processor. Scale oil dough into 20 gm and water dough into 40 gm. Wrap oil dough inside with water dough. 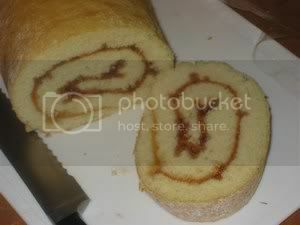 Roll flat and roll up like swiss roll. Roll flat again and roll like swiss roll. Cut each piece into halves. Roll out each piece cut side down and put in filling. Wrap filling and seal well. Preheat oven at 375 f Convection and bake for 10 minutes, remove from oven, glaze with egg yolks and bake another 15 – to 20 minutes. Heat oil and stir in the shallots. Add in flour and fry until flour is cooked and brown. Put in the diced char siew and fry for a short while. Add in water, all the sauces and sugar. Cook till the sauces thicken and gluey. Lastly add in the green peas. Set aside to cool . Buttermilk of times past was left after butter was churned. Today it's made by adding bacteria to nonfat or lowfat milk for thickened texture and tangy flavor. I used the cultured buttermilk which comes in powder form which is very convenient as you make the amount required. Add beaten egg, water and oil. Beat just until batter is smooth(do not overbeat). Drop from a spoon onto a hot, greased griddle and cook until top is full of tiny bubbles and the underside is brown.